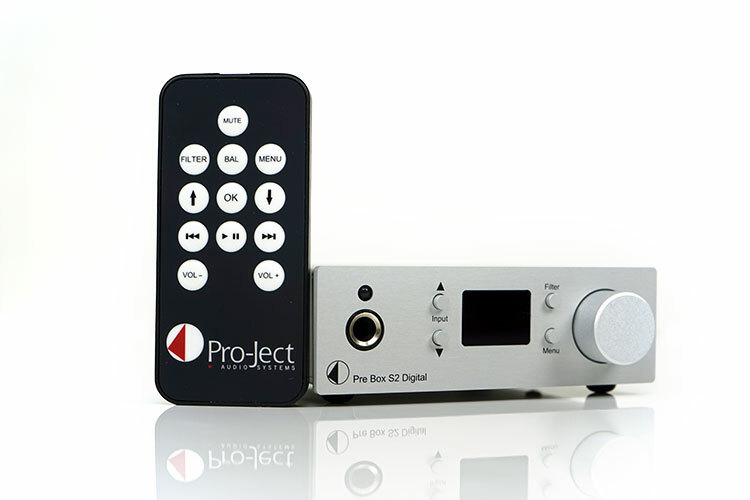 The Pre Box S2 Digital is part of the S2 line of micro-component products from Austrian manufacturers Pro-Ject Audio and it positioned under their Box Design brand. This is a super tiny DAC/Amp price at 349EURO or $399 and sits alongside the S2+ DAC Box and the Head Box S2 Digital components. The S2 line is pretty wide-ranging as it covers amps, phono stages, and speakers. For those that have not heard of Pro-Ject Audio before should turn to their pure Hi-Fi cousins who will wax lyrical about their very fine line of award-winning turntable solutions. These are eye-catching designs and I include myself as a paid-up customer since I use their diminutive Phono Box S for my own turntable system. In fact, Pro-Ject Audio have tons of these little box solutions and the Pre Box S2 Digital is the latest one to hit the market. What catches my eye about this is not just the size, but the use of a dual Es9038Q2M DAC chipset for under half the price of the Oppo Sonica DAC. Until this review, I did not think anything using the ES9038 chipset could much cheaper but here we are talking dual chip for less than $400. Admittedly, it is the Q2M mobile chipset but its still very competitive. 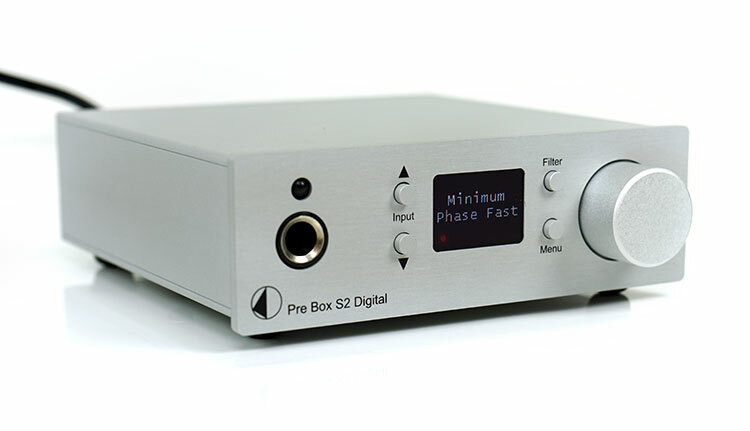 The Pre Box S2 Digital (henceforth S2D from here on) is a DAC, a pre-amp, and a headphone amp all wrapped up in a tiny box. The collateral is full of modern buzz words that tug on the strings of any digital audiophile’s heart such as full MQA unfolding, Roon integration (including TIDAL Masters) and the latest ES9038Q2M chipset with an ability to decode up to DSD512. With the dawn of USB 2.0 universal drivers in the latest Windows 10 edition, Mac compatibility as well as Linux and USB 0.5V power, the S2D is pitched as perhaps a “do-it-all’ device for the modern streamer. Those who want a degree of transportability, a small desktop footprint with remote control and enough power for headphones and earphones will want to look at this. 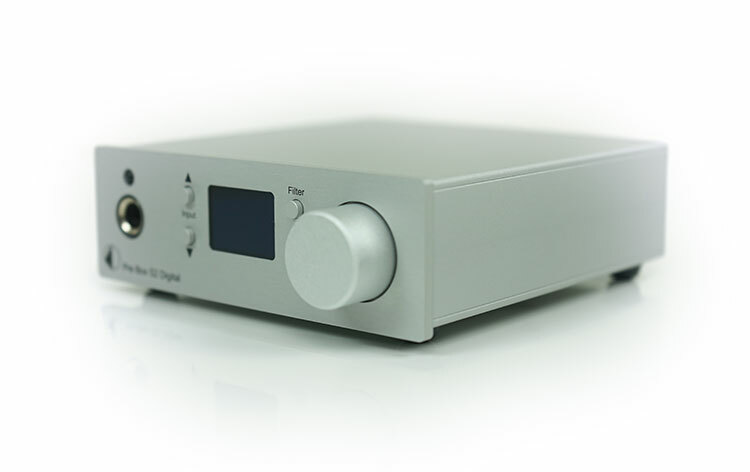 Even if you do not, this will fit nicely into your bigger system as a dedicated DAC with filtering options as well as a small pre-amp for analog output at the line level. One final pop for the price at $399. Dual ES9038Q2M is not that cheap. Regardless of implementation, those chipsets cost a bit more than AKM or TI on a per unit basis, maybe even on a volume basis. These are mobile chipsets but top-tier products and I am glad to see them being made far more accessible since my experience to date with the ES9028/38 range has been very positive indeed. This is a very small but very well-built box. The dimensions are a mere W x H x D 103 x 37 x 122 mm (including knob and connectors) so not much bigger than a JDS Labs 02 amp. It weighs in at 600g. The casing is a rock solid and very thick aluminum and it comes in either silver or black. This is a 3-part chassis with panels to the front and rear of the main body casing. Everything is held in place by 2 screws to the rear, one on the base and one to the front. The back panel on both variants is black though and all switches and input/outputs are clearly labeled in a white decal. If you are so inclined you can open it right up and take a peek at what makes this little thing tick physically. 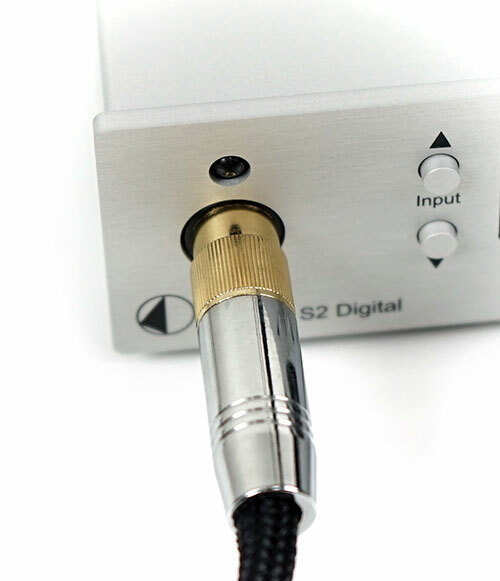 The S2D uses a small stepped attenuator analog knob for volume control. Each step increases or decreases by 1dB and the full scale is 0dB at the highest point down to -80dB. The display is a small but very bright and legible 1″ LCD screen. The viewing angle is actually excellent and I can make everything out at an almost 80-degree angle. I presume there is very little depth between the LCD itself and the front screen given the dimensions so no need for it to be angled for easy reading. The info is fairly well organized so you get to see most of the essential information in terms of playback quality, source, and power. You will not find anything fancy like tag reading for album art or titles but it will show you the decoding rate of the source track, MQA activated if being used, the digital input being used and if external power is active or not. All the I/O apart from the unbalanced 6.35mm headphone jack are too the rear of the S2D. The S2D operates primarily in the digital domain so it will accept a coaxial, optical and USB input. It will also power from just a USB input at 0.5V though the sound does improve somewhat if you use the USB as well as the external DC switching adapter together. 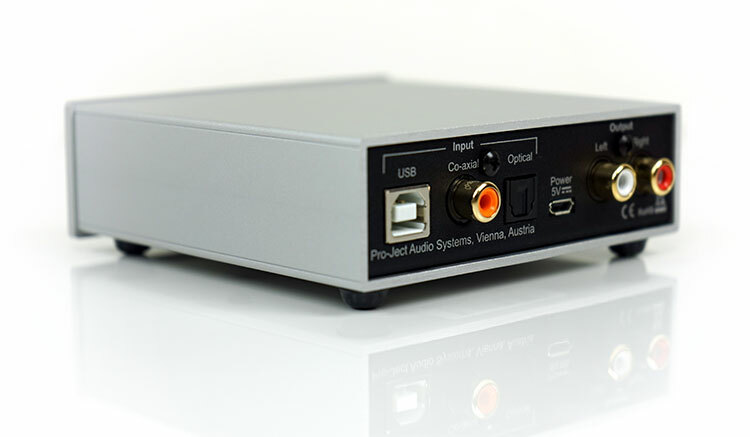 The analog outputs are the headphone jack to the front which is single ended and dual left/right variable RCA outputs to the rear for pre-amp duty for larger more powerful desktop solutions. Line out signal is set to a standard 2v (2.05) so there shouldn’t be any compatibility issues with larger analog headphone amps. There are two primary methods for controlling the S2 Digital. You can directly interface with it via its mix of input, digital filter, and menu buttons as well as tweak the volume with its stepped attenuator. The second method is via a supplied remote control which had similar features plus a measure of additional playback control that interface quite nicely with Roon, TIDAL and local software such as Foobar. Pro-Ject Audio have also gone one further with an additional proprietary filter you cannot find anywhere else called “Optimal Transient’. Filter settings and selected inputs are all stored after turning off the S2D. I must note at this point that if you are decoding MQA the digital filter option will be disabled. The second interesting control feature is called Distortion Compensate and can be accessed via the main menu option. Out of the box the S2D is set to distortion disabled. To enable it you tap the menu button once to bring up the distortion compensation screen. then you slide the volume dial to the left slightly and press the volume dial in to confirm. This option directly taps into the ES9038 to enable or disable the on-chip distortion compensation feature. I believe this works by targeting specific harmonic distortion, specifically 2nd and 3rd, that can arise with analog components either connecting to or inside the DAC design itself. If you have bought Pro-Ject Audio Box systems before then you will be familiar with the packaging. My Phono Box came in the exact same petite green and white retail packaging. This one is adorned with all the features and potential setup scenarios of the S2D front and back. Inside you get a 5v DC switching power supply adapter, a CD with the drivers, user guide and product info sheet. Sadly, no USB cable supplied so you will have to source one yourself to connect it. The adapter is terminated with a micro-USB connector which slots in the back of the S2D. The S2D uses a dual-mono Es9038Q2M chipset implementation which is the mobile 2-channel version of Sabre’s TOTL ES9038PRO. I have seen dual ES9028Q2M in the HiBy Music R6 though at a higher price point. The cheapest ES9038PRO chipset we have reviewed thus far was in the Sonica DAC from Oppo at $799 and this was a single chipset design. By all accounts, this is a competitive offering. Even Q2M goes for around $50 a chip on the open market and more expensive than the AKM chipsets (4490), sometimes triple the price. The cheapest I have seen is the Topping NX4 at around $150 but this uses only a single chip design and is primarily a portable device with no onscreen display. The lower power consumption of the ES9038Q2M also allows the S2D to run handily off a single 5v power source such as USB or the supplied DC switching supply adapter. It will not drain your PC or laptop in the process. The decoding capability of the S2D chipset is monstrous and very satisfying. 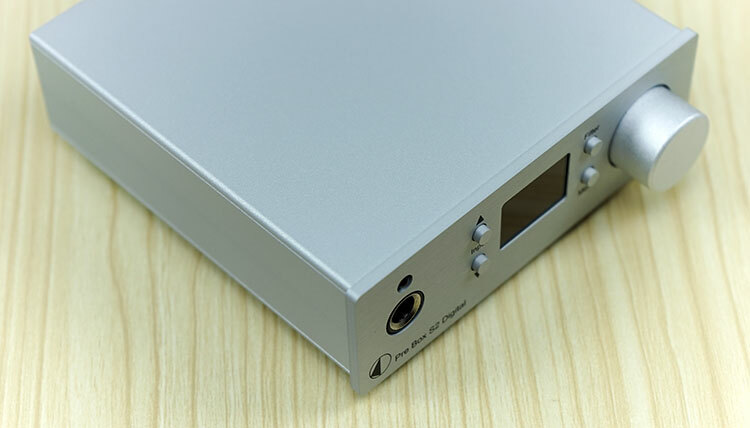 It can handle lossy and lossless right up to DSD512 and PCM at 32BIT/768kHz via USB. It will also handle up to 24bit/192kHz for its optical and coaxial inputs. On top of the out of the box filters, it will also confidently and fully unfold MQA up to 192k so those streaming from TIDAL will have no issues with their Masters’ collection. Pro-Ject Audio seems to have also wrung out a lot of the dynamic range potential of the ES90382QM with a 124dB rating whilst retaining a very competitive THD rating of 0.0003%. I am used to seeing those numbers from the new Sabre Chipsets but still remain impressed when I see them. The total harmonic distortion plus noise of -120dB (THD+N) is also quite excellent. Pro-Ject Audio have put a lot of thought into their digital audio design with the majority of input likely to come from USB. In comes a proprietary clock circuity design capable of up to 100 Femtoseconds for jitter control as well as active and passive filtering on the XMOS USB input to decrease noise floors up to -160dB. The Pre Box S2 Digital uses up to 17 voltage regulators in its analog section, two of which they have highlighted and both of them are again Sabre chips. The first is an ESS9602 headphone amplifier and output buffer stage which is actually the same stage you will find in the LG V20 smartphone. 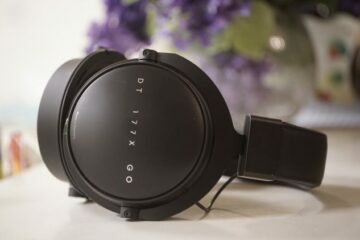 Output power is a little tame at 68mW into a 32Ω though dynamic range of 122dB and THD+N of -112dB is more than acceptable and should provide very low noise floors with efficient IEMs and headphones. I wouldn’t really push it more than that though. The second is another Sabre chip, this time the ES9311 chipset which is a low-noise, low-dropout regulator reducing the need for in-line output decoupling capacitors and specifically aimed at portable or efficient devices such as the S2D. Hi, Will I be able to hook it up with raspberry pi (Volumio / Rune Audio) USB out and take the RCA out to my integrated amp? Could you help me decide please? I really like what I read about ADI 2 Dac, but is it soundwise that better than this? Is it worth that extra money? Thank you! I have a big dilemma to complete my second sistem around TV : LG OLED 65 E7v (UHD 4K, harman/kardon 24/96Khz bilt in Dac ). I am a bit old, and have “analog” past, with tube pre-pow amplification, and far I got with digital, was Audiolab 8000CDM/8000DAC, twenty years ago. Now, for second sistem: TV is on one side, and Arcam power amp + Focal stand mount speakers with active sub, on the other side. I don t have dedicate pre amp. I tried to connect TV ( line out ) directly to pow-amp, but the result is clinical irritating unnatural sound, special with female voices . Adding pre-amp section bettwen did not change the rusult. The goal is to get best possible sound from tv materials (HD and 4K videos, which has a brilliat picture, but I do not know, how is with quality of audio packed with). There is a lot of Dac on market, acting as a passive pre-amp, but I see also a lot of comments, that they are acting poor when connected directly to pow-amp ( despite the signal strength is enough). I am considering the PRO-JECT Pre box S2. What can I expect from such configuration. Please help me to solve one dilema. I am considering to put S2 between my TV-LG OLED 65 E7 (bilt in dac 24/96Khz), and Arcam Delta 290 pow-amp-Focal stand mount-active sub. Did you listen S2 directli conected to pow.amp. Conecting some other device – dac directly did not produce listenable sound. Can I expect better sound from TV as source. No we do not use power amps here as a main desktop 2.1 and portable audio website. We do use the S2 connected directly to active bookshelf speakers and had no issues with the output. I am not sure what you mean by DAC did not produce listenable sound and better sound from the TV. Can you define better than what? You didn’t mention the DAC you are using. I am not sure a DAC inside a TV is going to live up the promise of quality sound compared to a dedicated DAC as most people use a HDMI connection out of their TV. 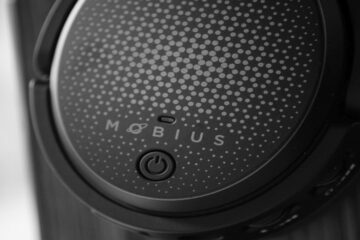 How do you think the S2 compares to the Mojo, as a dac for line-out? Personally, I am not sure I would use a Mojo for line out or as a DAC since it was never really designed for that purpose. However, that being said the S2 might sound a little more neutral than the Mojo.